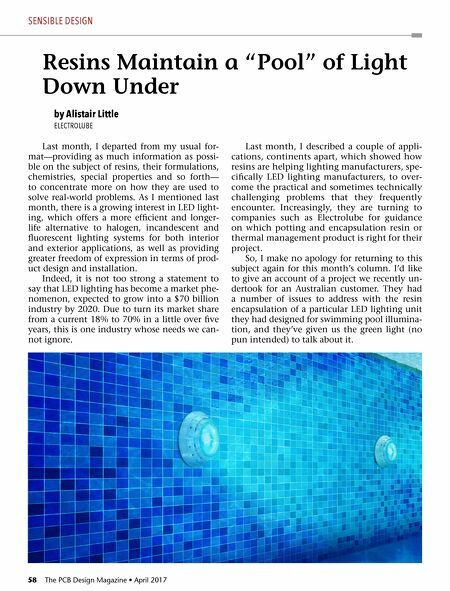 58 The PCB Design Magazine • April 2017 by Alistair Little ELECTROLUBE Resins Maintain a "Pool" of Light Down Under SENSIBLE DESIGN Last month, I departed from my usual for- mat—providing as much information as possi- ble on the subject of resins, their formulations, chemistries, special properties and so forth— to concentrate more on how they are used to solve real-world problems. 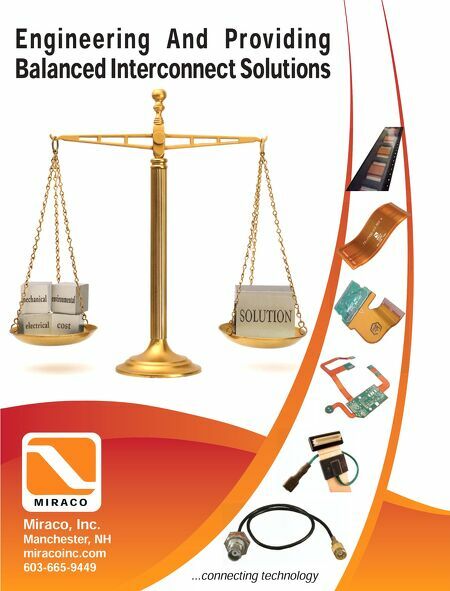 As I mentioned last month, there is a growing interest in LED light- ing, which offers a more efficient and longer- life alternative to halogen, incandescent and fluorescent lighting systems for both interior and exterior applications, as well as providing greater freedom of expression in terms of prod- uct design and installation. Indeed, it is not too strong a statement to say that LED lighting has become a market phe- nomenon, expected to grow into a $70 billion industry by 2020. Due to turn its market share from a current 18% to 70% in a little over five years, this is one industry whose needs we can- not ignore. Last month, I described a couple of appli- cations, continents apart, which showed how resins are helping lighting manufacturers, spe- cifically LED lighting manufacturers, to over- come the practical and sometimes technically challenging problems that they frequently encounter . Increasingly, they are turning to companies such as Electrolube for guidance on which potting and encapsulation resin or thermal management product is right for their project. So, I make no apology for returning to this subject again for this month's column. I'd like to give an account of a project we recently un- dertook for an Australian customer. They had a number of issues to address with the resin encapsulation of a particular LED lighting unit they had designed for swimming pool illumina- tion, and they've given us the green light (no pun intended) to talk about it.